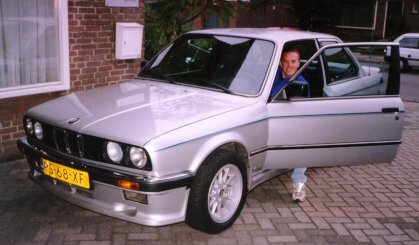 This was my BMW 320i from '86. It's a 2 liter 6 cylinder in-1-line engine with aprox. 125 pk(92kW)@5800 rpm. And aprox. 170Nm@4000rpm. Bought at 200.545 km. If you maintain such a car correctly and drive it hard only with a warm engine, it last for long. Water in the trunk; Waterdrains of sunroof were completly rusted trough (+/- 2 days to fix, including removal of back window). The drains were fixed with polyester and some fast hardening glue. Bad exhaust; replaced by a rust free DTM !! Which I should have replaced MUCH earlier. Bad rubber tube between engine's injector head to air volume meter. Worn rubbers at the back shock absorber mounts(bushings); Completely renewed. Worn Shift lever; Completely renewed. Driver's window rubber replaced, less wind noise. It was loosened by ??? New front tyres, were swapped with the rear ones. Worn front control arm bushings, replaced, steering wheel doesn't begin to bounce at certain speeds. Replaced extra air valve, open when engine not warm, with a electric one from 525i. This was diagnosed when I warmed up the engine and closed the valve with a whine bottle cork. New valve is connected to the petrol pump relay. Replaced valve cover's gasket. Showed some leakage. Think it's not replaced when distribution belt was replaced. Oil consumption; 1l at 3000 km/1500 miles. Especially when driving at 4000+ rpm. Head revision costs about $800, when let done by a specialized garage. Needed new rear tires (225-60 ??? 205-60 Now....) and shocks for back and front. Rear wheel chassis are rust-eaten (very much on the passengers site). The car was sold on 10th of June 2000 at 223685 km. 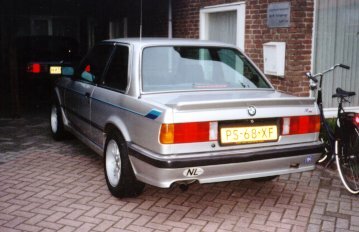 And replaced by a 1992 525i with 247000 km, of which a picture is shown on the right side!! 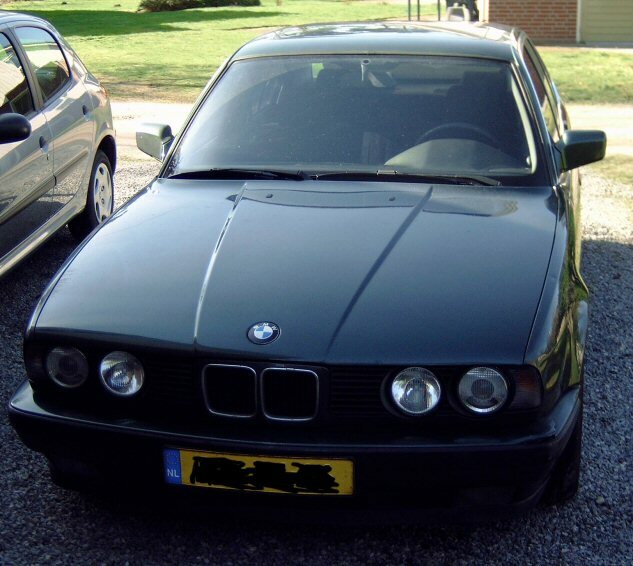 Above is a picture of my '92 E34 525i BMW. It's a 2.5 liter 6 cylinder in-1-line engine with approximately 192 pk@5900 rpm. And approximately 250Nm@4700rpm. Bought at 247.000 km. Around 260.000 the car had a problem with the automatic shift computer, it shifted gears not smoothly. It was caused due that when they mounted new rims and tyres the car fell down 10 cm due a to light elevator (max 1500 kg). The computer was replaced and reprogrammed, around 800 euro. Around 300.000 the headgasket was replaced. Oktober 2006 new front shocks(Monroe). Above some modifications can be seen, 17 inch Rims, Vented front brakes, DTM exhaust. First is the how it should look like, second is the worn part, thirth is the complete rod. Nov 2006, the speedometer and rpm meter were fixed with this fix . This because when the temprature outside dropped to around 5 degrees Celcius the meters started jumping around. And run at for example 20km/h if you were driving 80km/h. Feb 2007, the starter was replaced, it sometimes cranked without turning the engine around. Burshes and connection had gone bad. Gone to the wreck yard at 380.000 km (june 2009). It was still running nicely but needed new brake/gas lines. This is my BMW X5 from November '01. It's a 4.4 liter V8, engine with aprox. 286 pk(210kW)@5400 rpm. And aprox. 440Nm@3600rpm. Bought at 120.013 km. Things I've done so far tinted back windows, angel eyes. Below some pictures of the angel eye build in, (Note: black plastic lens holder, 2nd pic, is mounted with screws, they break easily!!) complete description at www.Xoutpost.com.